England have done, they’ve won a series in Australia. That game in Melbourne may well be the most significant moment in English rugby since England’s last win in Australia which just happens to be the 2003 World Cup final. Eddie Jones has taken England from eight in the world rankings to second in a matter of months. Just back in October Australia were competing for the World Cup against the All Blacks whilst England were trying to work out how 2015 had gone so badly wrong, nobody expected this. Not only has pride been restored to England but they have thumped the Wallabies and are now building a seriously powerful, abrasive, young squad. One part of the squad that is doing particularly well is England’s back row trio. Following Jones’ appointment there were cries including from myself to drop Robshaw and Haskell, how wrong was I? They are the two best players from the opening two tests by a mile. Haskell has been totemic in defence and a handful in attack at the breakdown and around the fringes. The Wasps openside seems to have picked up a slight knock following the test in Melbourne but he has certainly played a significant part in wrapping up the series. Chris Robshaw, a man reborn, many believed that once the Six Nations was over he would discard the Harlequins man along with Haskell. After the win in Melbourne how can he? Robshaw showed all the heart and dedication we have come to expect from him as a player. He also seemed to be a bit fiery in the game clashing with Australians on more than one occasion. Joe Marler may well rue his decision to sit out the tour as Mako Vunipola has been superb, his scrummaging greatly improved yet still offering himself up as a crash ball carrier along with his hugely talented brother, Billy. In the backs a partnership is flourishing between Saracens out half Farrell and Bath fly-half Ford. For a long time the 10-12 channel has been a problem for England but it seems Jones has fixed that problem. He has adopted a New Zealand like system playing another playmaker at 12 which can be referred to as a second five eighth. Ford and Farrell both playmakers in their own right but offer different things in attack and defence. Ford looks more relaxed with Farrell on the field, Farrell takes the kicking duties allowing the young fly-half to play his natural attacking game. Farrell can sit deeper with Ford at 10 which suits his style more allowing him time to make decisions bring his big forward runners into the game. Ford and Farrell. friends on and off the field. This is all down to Eddie Jones, Monday to Friday the week is fine tuned to give England the opportunity to win games every seemingly throw away comment, every training exercise, every selection call is engineered to help the team win the game. Jones is an expert he manipulates the media, he man manages to perfection, the praise he has heaped on Haskell and Ford has seemed to push both of them to new levels in an England shirt. He tells others to work harder and that has worked to with players such as Billy Vunipola and Marland Yarde now blossoming. He has built a core of around 23 or 24 players he knows what they can do and they can rest assured should they continue to perform they will continue to play. Eddie Jones can thank Lancaster for introducing the likes of Watson, Farrell, Ford, Kruis, Vunipola and Nowell to international rugby but let himself make them international superstars. It will be interesting to see if Jones is willing to take a gamble on any players in the third test. I’d like to see one or two given a go but with the core to remain the same. A whitewash would be truly something. This entry was posted in Uncategorized and tagged 23, australia, bath, chris robshaw, eddie jones, England, farrell, ford, james haskell, lancaster, marler, melbourne, saracens, tour, vunipola, wasps, World Cup, yarde. Bookmark the permalink. Over the past few years, England has struggled to put together a midfield trio that can play against the best in the world. Now though England have an embarrassment of riches at fly-half and centre. When you have a squad that at fly-half is so good you can afford to leave out Danny Cipriani that is practically the definition of strength in depth. Even without Manu Tuilagi the centres in the squad are a highly entertaining and talented set of players. All the centres also will be around come the 2019 World Cup that is of course bar injury or ban. After the first test though a clear partnership has emerged at fly-half and inside centre between George Ford and Owen Farrell. George Ford changed the game in the first test. Both fly-halves by trade, Ford started on the bench in Brisbane but after 29 minutes the 23 year old entered the fray due to a tactical decision by Eddie Jones. It changed the game. Burrell was not quite up to speed with the defensive system, Farrell’s move to 12 sured this up and Ford at 10 propelled England’s attacking game to a new level, as he set up two tries. Farrell also kicked well only missing one attempt at goal. England look set to start with the same combination come the second test which kicks off on Saturday in Melbourne and could secure England a first ever series victory in Australia. Jonathan Joseph seems assured to hold on to the 13 jersey for the foreseeable future even with the form Elliot Daly has been in for Wasps. With international rugby at the moment there is very little room to experiment with new combinations which means Daly may not get a chance unless Joseph suffers an injury. George Ford’s outstanding passing game and vision in attack added to Farrell’s metronomic goal kicking and superb game management allows England to create space for the real speedsters out wide. Anthony Watson and Marland Yarde are super quick and given space they are among the most dangerous finishers in the northern hemisphere and both have an extraordinary international strike rate. Farrell has finished at 12 for every game under Eddie Jones. Farrell and Ford are both still young as well at 24 and 23 respectively. They look like the long term solution to the midfield problem that has blighted England for years. A combination that can secure a series victory in Melbourne. This entry was posted in Uncategorized and tagged 2019, australia, brisbane, cipriani, daly, eddie jones, England, fly-half, george ford, melbourne, owen farrell, test, tuilagi. Bookmark the permalink. We have broken the Wimbledon men’s singles into the final 8, in that final 8 are the top 4 players with Djokovic, Murray, Federer and Wawrinka all playing tomorrow. Wawrinka may be 4th in the world but with a French Open victory under his belt and that ability to rattle the best tennis player over the last 3 years which is undoubtedly the Serb, Novak Djokovic he has a real chance of winning his 1st Wimbledon title. Yes, grass is very different to the hard courts and clay that Wawrinka has won major titles on before but the grass doesn’t seem to be bothering the Swiss player so far this year. Djokovic and Murray both have been put under huge amounts of pressure. Novak Djokovic after winning Wimbledon last year. Murray’s game against Italian Seppi was looking a very different game before the medical break taken by Murray after he lost 6 games in a row following Seppi’s earlier time-out. Djokovic was rattled by Kevin Anderson in his 4th round tie and looks like he could face some stiff competition if he does come up against Wawrinka in the semi-final. 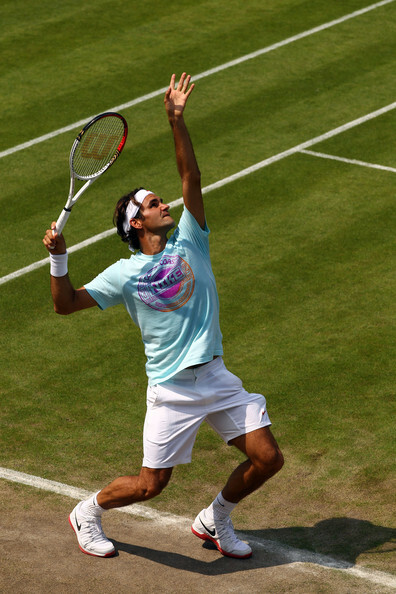 The only other top player that hasn’t been rattled is his countryman and the greatest tennis player of his generation Roger Federer whose grace and air of authority make him a pleasure to watch every time he takes to the courts especially at Wimbledon a place that he loves and the crowds paying him back with a huge amount of support. John McEnroe said that wherever Federer goes it must be “like he’s in front of a home crowd.” Not a surprise when you see the mild mannered, polite gentleman talk to the media. Federer practising during the 2012 Olympics. Wawrinka will fancy his chances and back himself to beat Djokovic again if he gets the chance, who’s to say they will both make the semi-finals. Nothing is guaranteed that is something we’ve certainly seen so far this year with the women’s draw as Jelena Jankovic knocked out holder Kvitova and Nadal being beaten in the second round. Wawrinka is destined for greatness his win in Melbourne last year was the start of a surge from the Swiss player who has forced himself into the top 4 and is sure to be a contender at the US Open later this year and of course the ATP Finals at the O2 Arena in London in November. His victory in Paris showed his ability to beat players that would have been well fancied pre-match which saw him make history at Roland Garros. It wouldn’t be wise to bet against him now, in the form of his life and closing in on Federer as the Swiss number 1. Wawrinka’s route to the final isn’t an easy having to face Gasquet and then either Djokovic or Cilic depending in that other quarter-final. 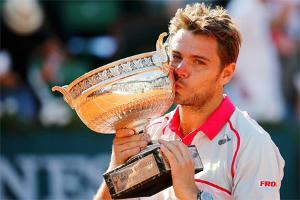 However I am certain Wawrinka would rather face Djokovic than Federer or Murray who are in the other side of the draw. Wawrinka knows how to manipulate the Serb and really make him feel uncomfortable on court. Wawrinka has a massive opportunity and this week could define his career over the next decade and which players dominate the majors over the coming years. It is a vital week not just for Wawrinka but the sport in general. This entry was posted in sport, tennis, wawrinka, wimbledon and tagged 2012, 2014, 2015, 4th round, anderson, andreas seppi, atp finals, brit, cilic, clay, djokovic, federer, french open, gasquet, grass, hard, jelena jankovic, john mcenroe, london, majors, melbourne, murray, nadal, o2 arena, olympics, paris, petra kvitova, quarter-finals, roland garros, semi-finals, serb, stan wawrinka, swiss, tennis, us open, wimbledon. Bookmark the permalink.